Friday in Euston in the spring, half past four in the afternoon. I’ve just been to a Training Event Thing for work. As a responsible public sector employee I made sure to save the taxpayer a few quid by booking a cheaper train a little after rush hour. The fact that I can spend a couple of hours in the pub is, you understand, neither here nor there. Feeling mildly adventurous, I duck straight in to the first pub I see, rather than making directly for the Euston Tap. This turns out to be the Royal George. It’s already busy, and before my pint is half gone it graduates from busy to rammed. The walls and ceilings are festooned with the flags of many nations, in anticipation of Euro 2012 and – if I’m allowed to mention it without paying a £28million sponsorship fee – the Olympics. In many ways this place seems to me the archetypal London boozer. It exemplifies the way London sustains so many pubs that are just decent without being great. Anonymity, but not unfriendliness? Check. A choice of cask beers that’s not outstanding but pretty much OK? Check. Beer served almost flat and a little bit warm, but not so much as to spoil it? Check. Not for the first time, I reflect on how long it might take, if you were looking for a truly awful pub, to find one in London. Drift into places at random in, say, Brighton or Birmingham, and you’d end up somewhere quite terrible before very long. The capital is different. It has a smattering of great pubs, which is good. But it has hundreds and possibly thousands that are just alright. And because drifting is better than planning, this is arguably even better. 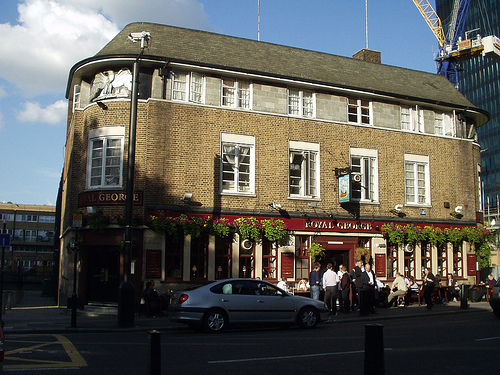 There are other distinguishing features of the Royal George which mean it could only possibly be a London pub. Impossibly complicated graffiti in the back of the toilet door? Check. I head over to the Euston Tap afterwards and it’s too busy to even see the door. The Bree Louise is almost as packed but just about tolerable. So let’s hear it for pubs that are just OK. At least you can always get a seat. A similar experience of cheerful adequacy is easily had at the King & Queen, just down the road in Fitzrovia. There’s a mixed crowd, a nice room and a decent pint of Tribute. I was there just the night before the Training Event Thing, and I’m back a couple of weeks later to play a solo set at Totally Acoustic. As I approach, guitar strapped to my back, I am exultant with joy to see a huge crowd spilling outside from the pub and onto the street. It’s not often I get to play to so large and enthusiastic a crowd. My excitement is matched only by my deflation when I realise they’re all here to see Spain v Republic of Ireland on the telly in Euro 2012.